2016 seems to be the year of the psychological thriller and this one is another absolute treat and had me rating it 5 stars on GoodReads! 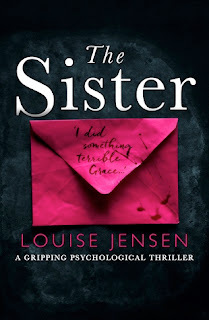 Shocked to find out that it is the debut novel from the author Louise Jensen, as it was so polished and I will definitely be looking out for all her future books! This turned out to be one of those books that has you thinking about it even when you're off doing something else, and that you can't wait to get back to! Even worth losing sleep over as you rush to finish another chapter or two just to find out what revelation will happen next, as there are plenty throughout! It is cleverly written in the Now and Then so you get to see what happened to Grace while she was growing up and getting to meet Charlie for the first time at school, and then you get to see life now that Charlie has died and how it has affected Grace and all those around her as she struggles to come to terms to life without her BFF. You soon find out there is more to the story than meets the eye on many counts and the cast of complex characters adds to this as just when you think you've sussed things out, another character will be introduced and your mind will change yet again! The tension is high throughout and peaks towards the end with a scarily chilling last few chapters - no spoilers!! Cannot say much more about this book other than read it for yourself!! You will not be disappointed! !